When Claire Guernsey, Henry Summers, and Rose Norris first applied to Christendom, they had an idea of what kind of education they would get. 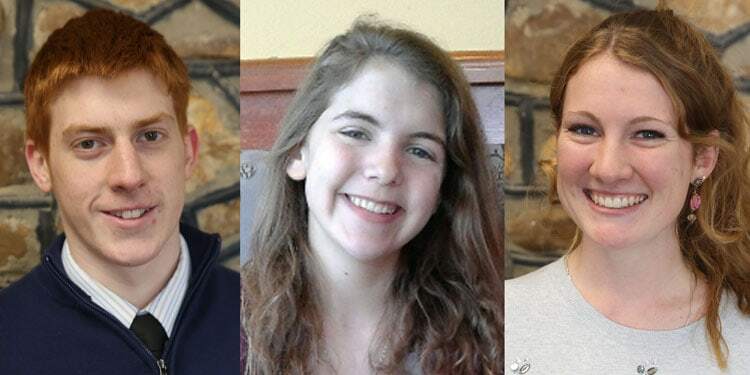 As they each moved through the application process, the Padre Pio Full-Tuition Scholarship Competition, and the eventual winning of that competition, they grew in their excitement and in their expectations. And yet, with one semester complete, the Christendom experience thus far has exceeded even those expectations, with the classroom experience and the campus culture singled out as particular highlights. From left to right: Henry Summers, Rose Norris, and Claire Guernsey. For Summers and Norris, they are both the children of alumni parents, so they heard about Christendom their entire lives. Even with that first-hand exposure, the classroom experience has wowed them both so far. 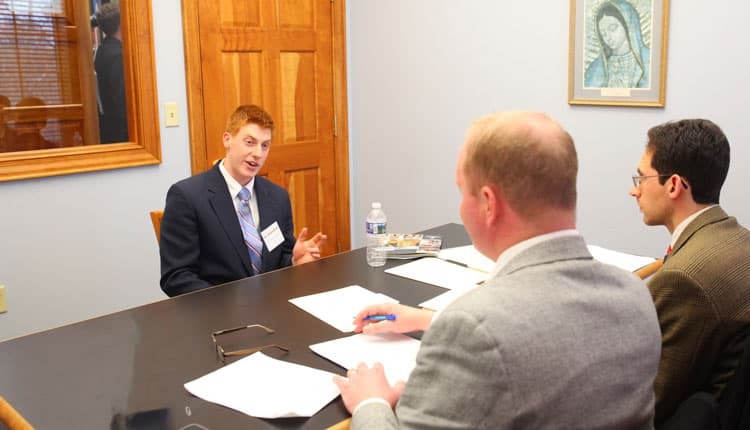 Summers wowed the faculty panel during his Padre Pio Full-Tuition Scholarship interview. Christendom’s education seeks to form the whole person — something that was very appealing to all three winners. Norris was raised nearby Christendom in Front Royal, Virginia, so she has seen the Christendom mission of “restoring all things in Christ” take place first hand in her own community. Seeing that mission in practice led her to not only apply for the college but also for the Padre Pio Full-Tuition Scholarship Competition. The rigorous process, which requires applicants to have certain standardized testing scores and submit a resume, eventually led Norris to become a finalist and be invited to campus for the competition. 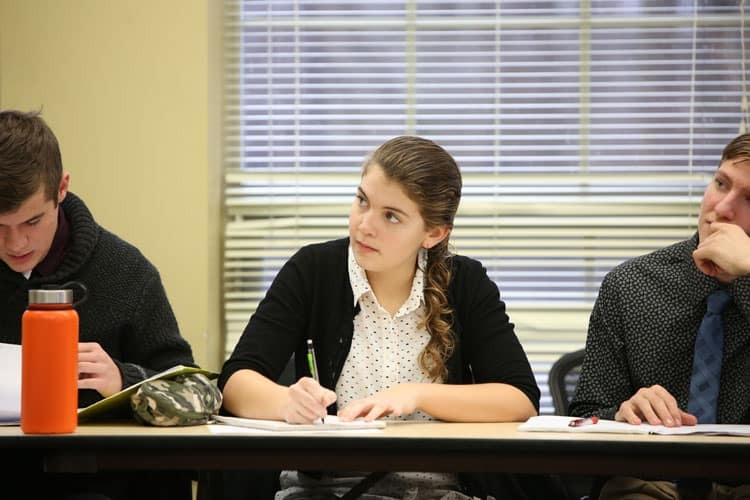 While there, Norris shined in the essay competition and in the faculty panel interview, resulting in her coming to Christendom for only the cost of room and board. After one semester, Norris is already feeling more confident in her ability to go out into her community and have a positive impact on it. Norris is loving the classroom life at Christendom, and believes they are helping her flourish. Guernsey feels similarly. Hailing from Ave Maria, Florida, Guernsey did not have a prior connection to Christendom like Summers and Norris but still saw it as her #1 choice for college, due to Christendom’s emphasis on challenging students to grow fully as human persons. She has certainly felt the challenge so far but also the reward, with her knowledge increasing along with her Catholic faith. Guernsey is also involved with varsity volleyball, the Shield of Roses pro-life group, and serves as a student ambassador on campus, taking full advantage of all that Christendom has to offer. 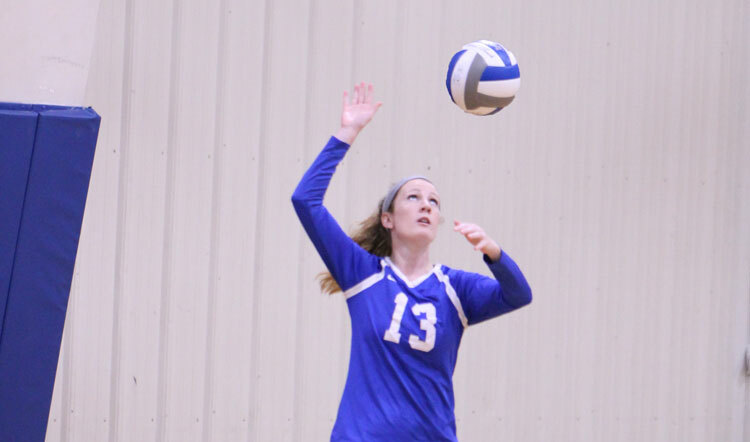 Guernsey made it onto Christendom’s varsity volleyball team in her freshman year, and helped the team reach the USCAA National Championship — a first for the program. To paraphrase something that Christendom’s founder, Dr. Warren Carroll, once said: one semester can make a difference. The Padre Pio Full-Tuition Scholarship Competition enabled Guernsey, Summers, and Norris to come to Christendom — something that has impacted their lives for the better, according to them. With one semester down and many more to go, the chances to grow even more in education and in faith are numerous, making Christendom more exciting than ever. Find out more about our Padre Pio Full-Tuition Scholarship Competition here.